This Flashback Friday for the 13 Creepy, Kooky, Spooky Jessica Rabbit Halloween Pins countdown is filled with torture, mayhem and suspense!! For many years it was well known that Jessica's Halloween pins sold out all too quickly after release. There was no limit amount on how many you could buy and the pins did not require a phone order during this time. It was chaos once again and the pins sold out in no time. That is, if you could find them on the site. Disney changed the look of their site and people were having a little trouble navigating through it. Aside from that, every Monday pins were listed between midnight and 12:30 am (again for people on eastern time that's 3 in the morning!) Sometimes there is a little lag getting all the pins up, which is understandable. This did not happen the week before and mysteriously, none of the other Halloween pins that week sold out. 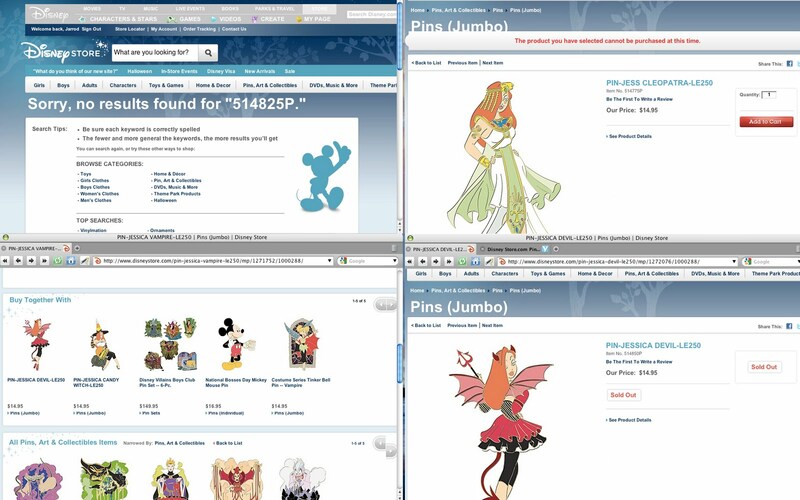 People waited and waited for the 2010 Jessica Halloween pins to appear, but they did not. Pin message boards were lighting up with confusion - especially when one or two people claimed they found the pins - even though the majority of people could not. An hour turned into almost two and finally someone posted a link where they found the pins. The link did indeed work - unlike a previous link which turned up a blank page. By then though, two of the four pins had already sold out. There were other pins in the Jessica series. Jessica Rabbit as Cleopatra, with flowing robes, adornments, details, and pose - all worked well. It's nice to see they used two colors for the inner and outer green on the cape, and there is even some egyptian makeup under her eye. 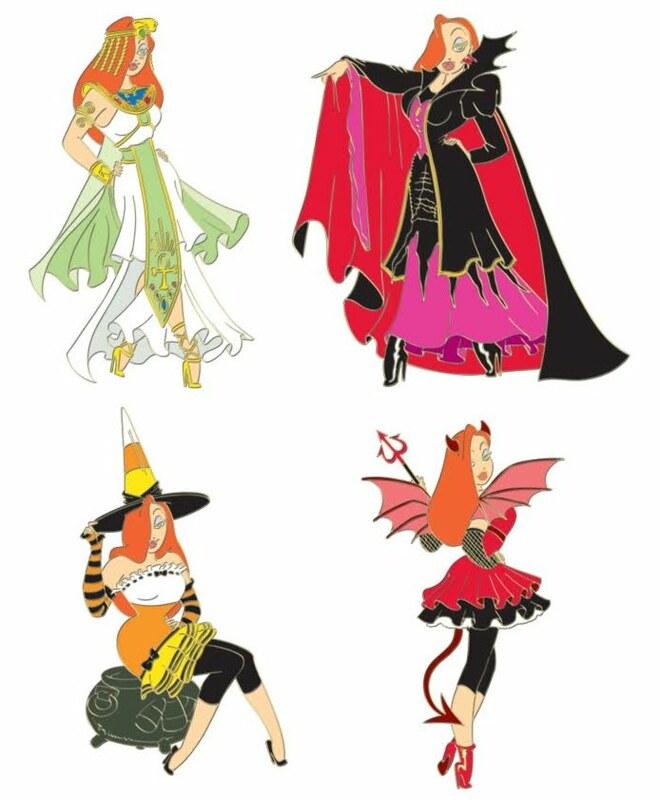 Jessica Rabbit as Candy Witch - which might look familiar as it is based off a real Halloween costume. She wears a candy corn colored witch hat and dress with black and orange fingerless gloves while she sits on a cauldron. Surprisingly she's wearing black leggings this time. Jessica Rabbit as a Devil was one pin to sell out quick. She has red horns, pitchfork and tail, black net gloves and a red, black and white mini dress. This time, unlike her other devil pin, she has red wings which feature red glitter. Jessica Rabbit as a Vampire was the other one sold out. Jessica is dressed as a victorian era vampire with a flowing back cape that is red inside. She has a high spiked collar coat, purple corset and long black and purple dress. Watch out, she also has fangs!